As we near the middle of the year and therefore have, at least in the Northern Hemisphere (i.e. Germany), long days with lots of sunshine, renewable energy statistics start to appear in the media and the renewables distortion field enveloping much of Europe expands just that little bit more. 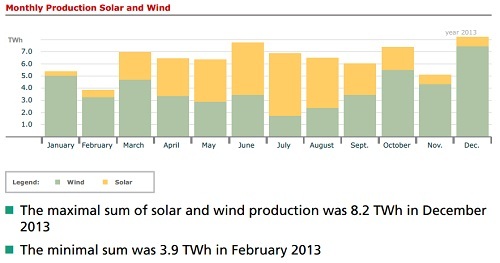 The first of these I have come across was posted by a number of on-line media platforms and highlighted the fact that on Sunday May 11th Germany generated nearly three quarters of its electricity from renewable sources. Given the extraordinary level of solar and wind deployment in recent years, it shouldn’t be a surprise that this can happen. But it’s rather a one sided view of the story. The flip side is of course December and January when the solar picture looks very different. 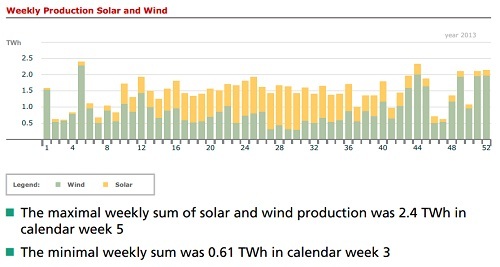 The Fraunhofer Institute for Solar Energy Systems ISE use data from the EEX Platform to produce an excellent set of charts showing the variability of renewable energy, particularly solar and wind. The monthly data for solar shows what one might expect in the northern latitudes, with very high solar in summer and a significant tailing off in winter. The ratio between January and July is a factor of 15 on a monthly average basis. But wind comes to the rescue to some extent, firstly with less overall monthly variability and secondly with higher levels of generation in the winter which offsets quite a bit of the loss from solar. The combination of the two provides a more stable renewable electricity supply on a monthly basis, with the overall high to low production ratio falling to about 2. One could argue from this that in order to get some gauge of the real cost of renewable energy in Germany, monthly production of 6 TWh of electricity requires about 70 GW of solar and wind (average installed capacity in 2013, roughly 50% each). By comparison, 70 GW of natural gas CCGT online for a whole month at its rated capacity would deliver 51 TWh of electricity, nearly a factor of 9 more than for the same amount of installed solar plus wind. But to be fair, some of that 70 GW of natural gas will have downtime for maintenance etc., but even with a 20% capacity loss to 40 TWh, the delivery factor is still about 7. For solar on its own it will be closer to 10 in Germany. But this isn’t the end of the story. Weekly and daily data shows much greater intermittency. On a weekly basis the high to low production ratio rises to about 4, but on a daily basis it shoots up to 26. Fortunately, Germany has an already existing and fully functioning fossil fuel + nuclear baseload generation system installed, which can easily take up the slack as intermittency brings renewable generation to a standstill. But the cost of this is almost never included in an assessment of the cost of renewable power generation. In Germany’s case this is a legacy system and therefore it is taken for granted, but for countries now building new capacity and extending the grid to regions that previously had nothing, this is a real cost that must be considered. This is perhaps an anti-leapfrog argument (being that regions with no grid or existing capacity can leapfrog to renewables). The German experience shows that you can shift to renewables more easily when you already have a fully depreciated fossil & nuclear stock, and your demand is flat. Otherwise, this is looking like a potentially costly story that relies on storage technologies we still don’t have in mainstream commercial use. As a complete aside, but certainly the “flip side” of another issue, I came across this chart which highlights the flip side of rising CO2 levels in the ocean and atmosphere due to the combustion of fossil fuels – falling levels of oxygen. This is a very small effect (given the amount of oxygen in the atmosphere) and certainly not an issue, but it’s entirely measurable which is the interesting bit. 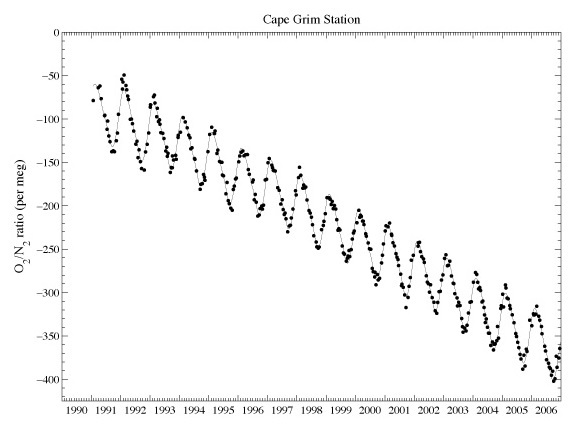 The chart is produced by Ralph Keeling, son of the originator of the CO2 Keeling Curve. 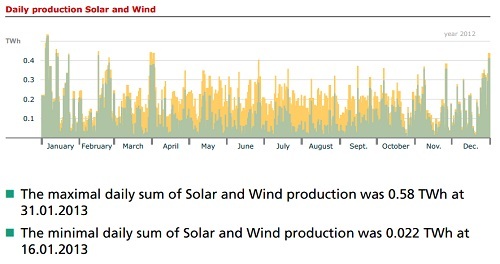 Really good post David and excellent point about ‘productivity’ of renewables. As always, valuable Insights – so nessecery to understand the compelxity of the grid and the operators challenge . The electricity cost of PV+battery for rural off-grid applications is certainly higher than that of a large coal plant + grid. However, PV+battery+DCmicrogrid is now *cheaper* than a diesel generator, which is highly polluting and causes health damages. If diesel subsidies were diverted to poverty reduction measures (a more efficient allocation of public money) off-grid PV would soar. This would still be a small loss for the fossil fuel sector, but it will give to PV (and batteries, LEDs, and other high efficient DC appliances) an additional large market to further descend the learning cost curve. You should note that PV has over-delivered the forecasted cost reduction with cumulated installed capacity (and onshore wind is on track too). I agree that this is a potential solution for the genuine small village powered over a micro grid, but is it a practical option for that same group of people as they move to industrialise. Will it run the cement plant they want to build, or the local smelter, or the machinery factory or textile mill. I seriously doubt it.